Discussion in 'Archived Reports' started by Ed Young, Feb 11, 2019. Tell me who is buyer / seller in this transaction. Just let me know if both parties is ready. @Ed Young Send the Payment email that you are using. Im waiting for the seller trade offer right now. Have you installed Mobile authenticator ? There was an error retrieving your trade offers. Please try again later. Did you logged in , in Site? 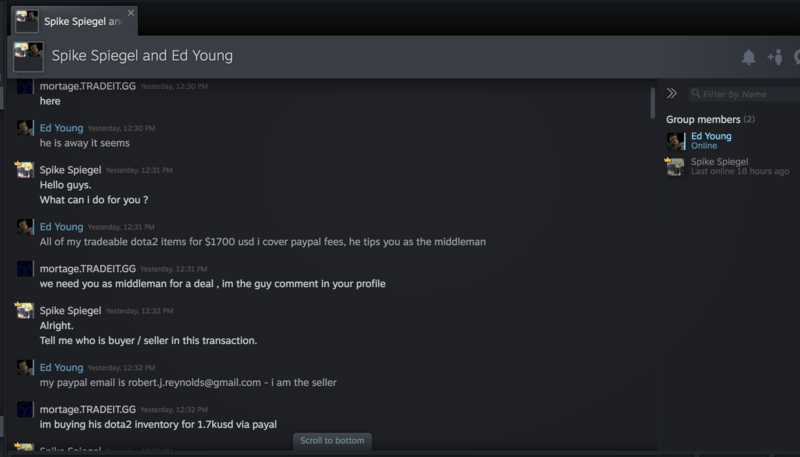 I accepted his trade offer but it says CANCELLED. I sent the last offer. @mortage.TRADEIT.GG Send Payment to the Seller. It has been one hour since he said he was logging in to his paypal account. Is this all the evidence you have? So far you have nothing here proving that either of these users are involved in a scam or in a scam just that they wanted to use a a middleman which is pretty common. You mean the fact that I traded the items to the intermediary and then never received payment or my items back is not proof? The second they got the items they unfriend and ignore me? What more would you like. if you don't create two reports then it doesn't place a REPORT on the other persons profile so you are walking some other unsuspecting person right into the same scam. You only make ONE report for the single event... when you split up users like that for one event it makes investigating them harder. This is how it has to be done. Ok so you did trade items and didn't get paid correct? You didn't specify that so I had to ask. I can send 10 more pictures because it was so many items. I traded all the items to the Spike guy. It was across three trades because steam was crashing with so many items. Do you want me to do it for all three? This trade had most of the value. You can see the others in the screenshots above. Sure but they must be FULL screen...those are not full screenshots.